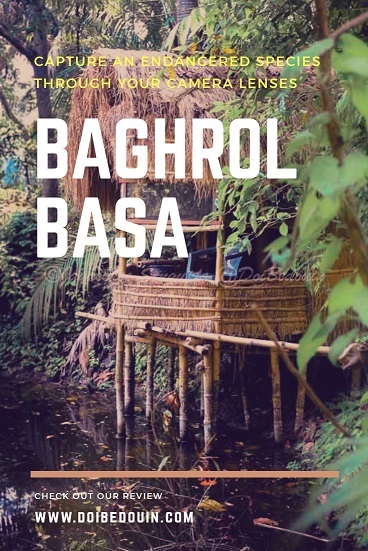 Travelling back in time to the 17th century and yet feel at home, preferably like the Jamindars of the then Bengal, is just the kind of experience that Baghrol Basa has to offer. 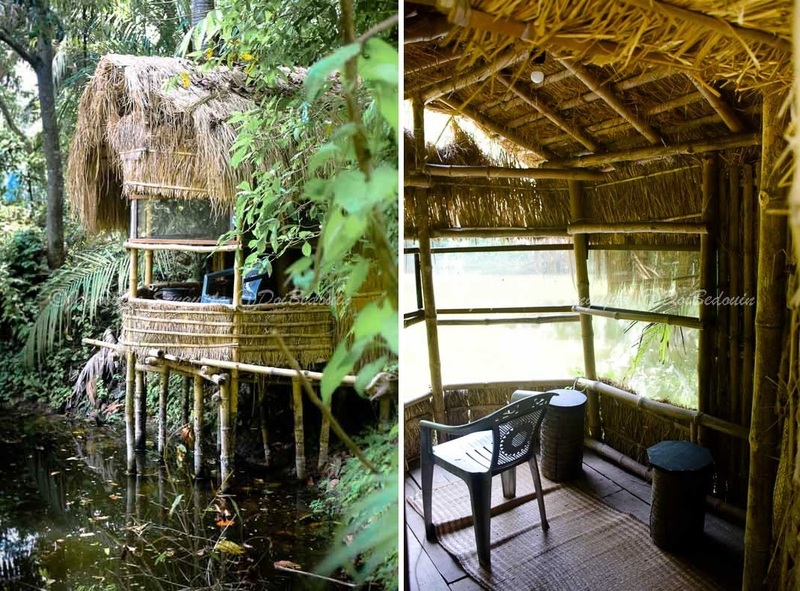 A perfect staycation amidst the myriad cacophony of nature, away from the strident city life. 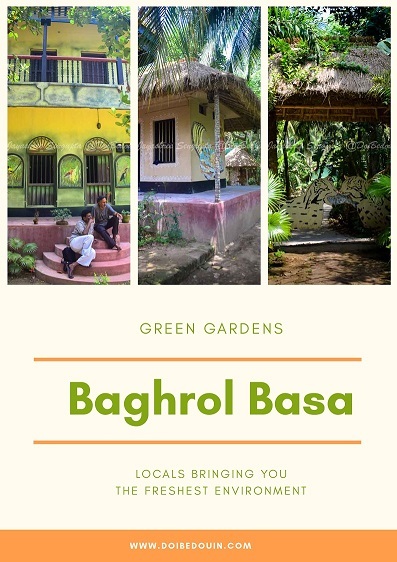 From the considerable finesse of the complimentary graphic display on the clay walls of a typical village mud-house, to the various eco-friendly aspect of the property, be it preserving an endangered species or organic farming, Baghrol Basa of Amta, Howrah (West Bengal, India) is a fascinating stay offering a delightful rustic feeling. 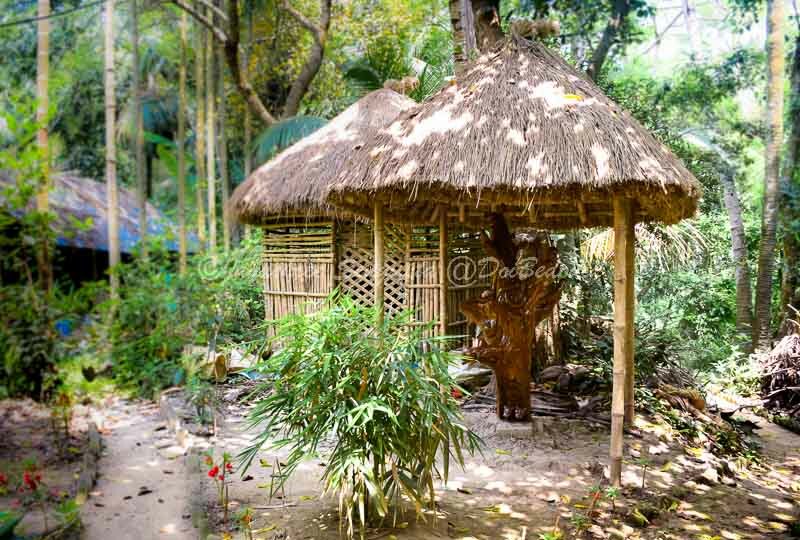 Situated in the interiors of a village locality of Gajipur, Amta, Howrah of West Bengal (which also happened to be my maternal connection) the erstwhile Ghosh Bari of Kalbansh is a locally known name. Cycling through the paved village road, accompanied by my uncle, we pedaled in through the bamboo bushes and a number of ponds. On reaching we were received with a homely welcome to the grounds of the property by Mr. Asim Ghosh, the owner and proprietor. For me it was more like connecting to my mother’s roots, getting to know her from close enough. On the way to Baghrol Basa we came across many ponds children having their morning play in the waters, sailing on a “Donga”, a boat hewn from the trunk of a palm tree. I have heard stories of my mother sailing my cousin brother on one such donga on our (maternal) own pond. But what fascinated me more was sneakily observing the Komodo Dragon lurking from beneath the pond scums or by its marshy edges, from the window of my mother’s room. The garden is a literal pandemonium of Greens all around with various plantations sprouting here and there. Jackfruit trees grew wild around the garden with flanks of other shrubs. The property is hedged by paan-leaves twined bamboo fences. Other flowering plants strewn throughout the garden and along a second pond in the backyard of the house. Straw sheds frequented the plantations, a wood motif depicting the Baghrol hunting the fish paves the way to the primary fishpond. One may sit on the ‘ghats’ of the pond in the day hours, to have a peep of the stork-billed kingfishers, jungle babblers and treepies, often a catch for the camera here. “Baghrol” meaning fishing cat in Bengali and “Basa” means nest or house. As the name suggests, Baghrol Basa is thus a home to the endangered fishing cats. Stepping into the interiors of the house one would wonder at its sheer excellence in its very simplicity. It would represent the meager living in a village mud house with a touch of sophistication. 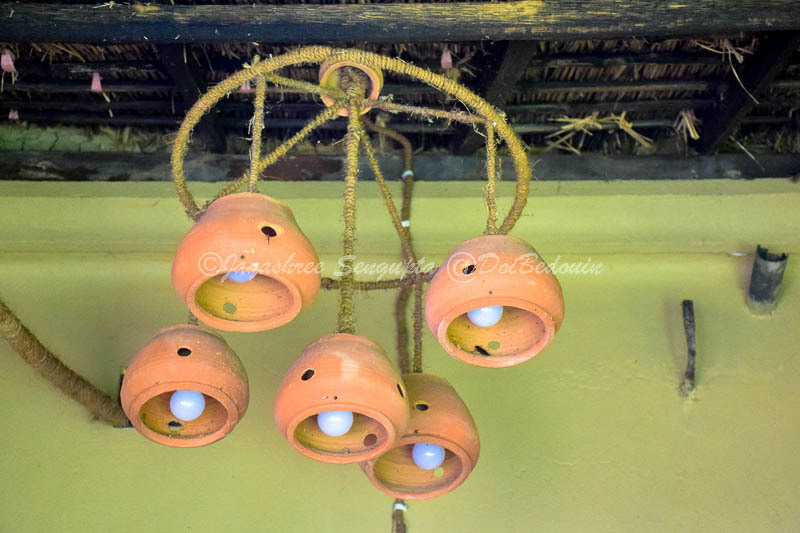 From the chandeliers made of the clay curd-pots and engraved wooden mini fountain in the inside to the dim-lit hurricanes hanging on the corridors, all adds up to the dramatic surrounding is attractive enough to cast its spell on you. 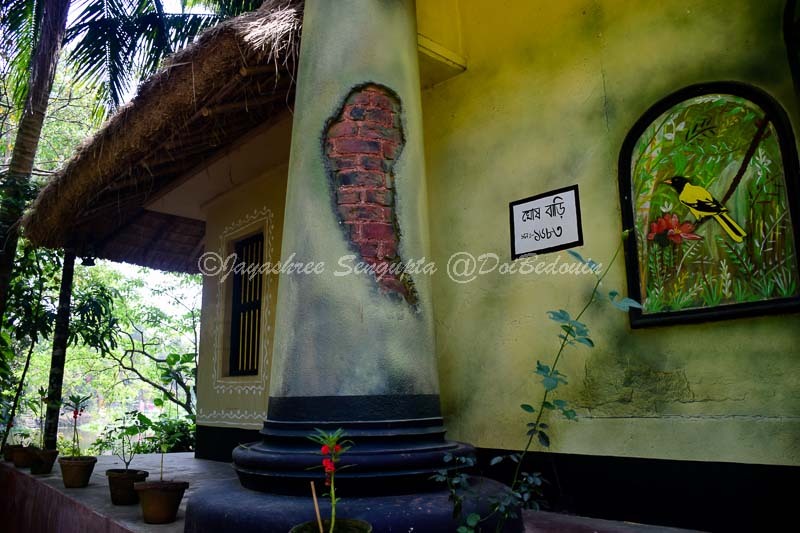 The wall motifs in the dining, the verandas flecked by straw would always kindle the mystery in you. As in the night crawls in, the chirps of the birds are overcome by the songs of crickets and cicadas; often punctuated by the croaks of the toads in the monsoons. This Nature's lullaby is chaperoned by a theatrical luminescent light-dance of the fireflies. One might choose to spot the Baghrol over the CCTV and continue to snuggle on a couch or to quietly wait for the perfect timing, in the bamboo-straw made watchtower by the primary fishpond, to capture (in your lens) the Baghrol preying in the dark hours of the night. To top it all, one’s hunger is met by the local Bengali cuisine which not only feeds the appetite but also one’s heart. Even after weeks one would cherish their stay on a fulfilling weekend here. 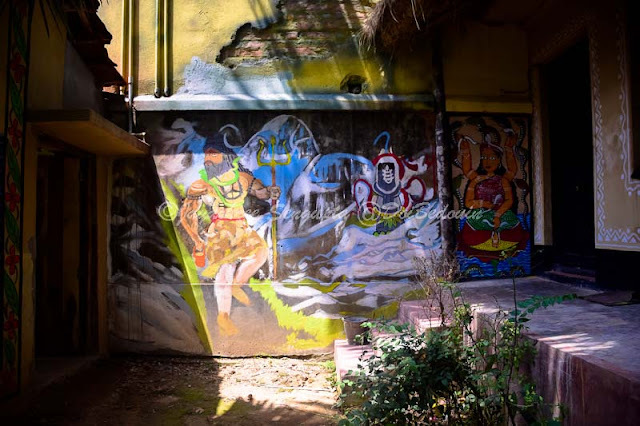 The house stands as a flamboyant canvas of green and yellow, with the annex structure as an all-clay affair, in lieu of the oddities of the nature, beholding the history of the place itself. The flood of 1978 swept away all the clay houses of the area, a portion of my own maternal house was included; the area recovered from the flood and came a long way since then. The Damodar river in Amta generally overflowed during the monsoons previously, and turned the surrounding areas into wetlands which flourished the survival of faunas such as the fishing cat and monitor lizards. 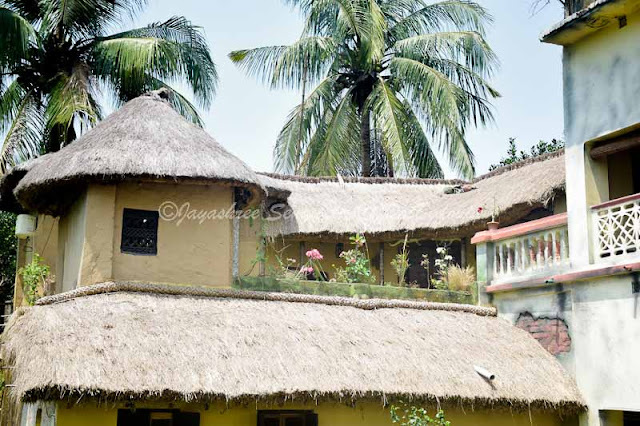 The annex clay house holds a four bedded clay jamindari suite with attached western toilets & balcony; adjacent to which is a pakka double bedded classic jamindari suite with attached western toilets & balcony. 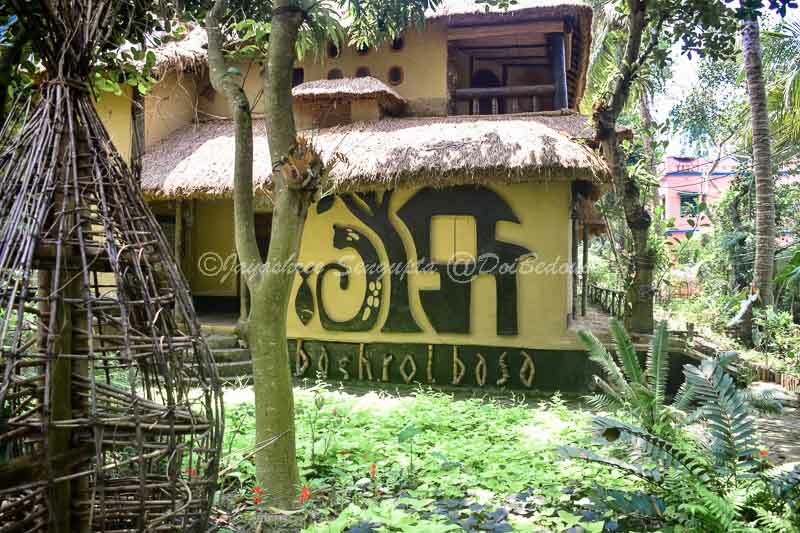 The dining is decorated with a sophisticated old housing touch with the ceiling held by the “kori-boroga”style typical of the old houses of Bengal. Find the details here. The exterior is exquisitely highlighted to fuse together the outlook of the Jamindari House and a local Kaccha housing. The walls are painted depicting the local culture and the theme of the homestay. The garden is frequented with sheds with locally grown herbs and shrubs to offer an overall eco-friendly stay. The local transport is also going eco-friendly with the availability of e-vehicles. Cycles (local) are also available for pedaling out on the village roads. Baghrol or Fishing cat is an endangered species and is declared the state animal of West Bengal. Few days back, I was made aware of the fact, courtesy the whereabouts of the homestay. A decade back people used to kill the fishing cat. But now killing a fishing cat is as punishable as killing a Royal Bengal Tiger. 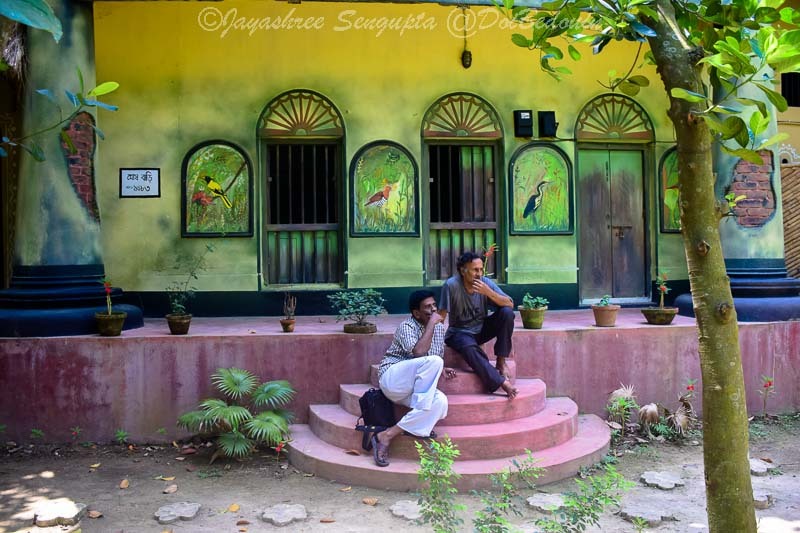 The homestay besides the pleasant stay, does not only offer lucrative catch for the wildlife photographers but also impart the knowledge of saving the species which is nearing extinction. In India, the fishing cat is included in Schedule I of the Indian Wildlife (Protection) Act, 1972 and thereby protected from hunting. Under this Act, an offender found guilty can be punished with imprisonment for a term of up to three years or with a fine, which may extend to Rs. 25,000/- or with both. March and April: During this time the species breed. Kali Puja. The village lights up in the essence of deepavali. Pick up is arranged from the airport if informed earlier. Or one can reach Amta by train from Howrah. 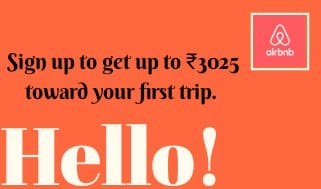 Buses are available from Howrah to Narit and Jhikira. One can get down at Gajipur Bazar and walk through the paved roads. One might contact through their Facebook page for booking. That looks like a pretty crazy place to stay, but definitely worth the experience. I always try to give value to the eco friendly vacation even if it is too out of my confort zone. What I often don't understand is that they are too expensive compared to the service they give and this makes me many times to go for a normal hotel option. I'm quite aware of the Zamindari system that existed in Bengal for centuries but I have never heard of this place before. I believe there are many beautiful mansions of Zamindar even now that narrate the grand life the Zamindars lived. I hadn't come across the Baghrol or fishing cat before but good to hear they are now protected. 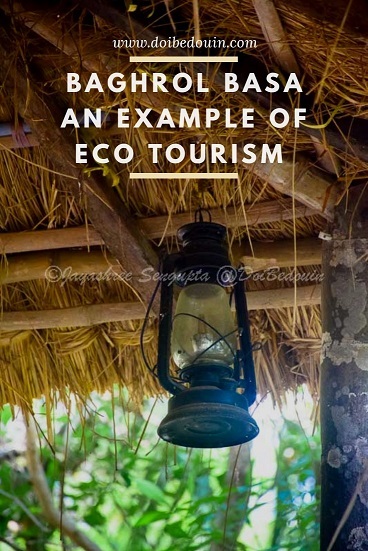 Being able to stay somewhere and contribute to conservation aims is an excellent model for travel. Thank you for sharing. Baghrol Basa looks like an amazing place to visit. 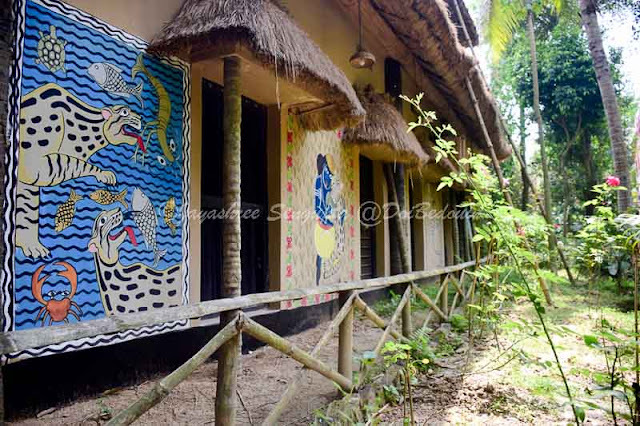 There are so many interesting places all around rural Bengal that can become great tourism destinations. 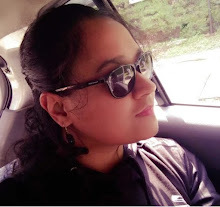 I loved the way how you narrated your childhood stories with your travel stories. Would love to visit this place someday! Oh My goodness!! Yoi are right! It was a step back in time. Thank you so much for affording me the opportunity to live vicariously through your travels because I don't know if I would be able to navigate to that location. As a disabled traveler, some places i have to visit through others. Your pictures are beautiful! This looks like a wonderful experience, made all the more special by your family connection. I have never heard of Fishing Cats and am so glad they are now protected! (All cats are such amazing creatures, in my opinion.) I particularly like the artwork that appears throughout the homestay. What a unique place to visit. I think I would really like it!